Q&A: Would a compass work on the moon? Question from Jamie: I was playing around with my brother’s compass the other day and it got me to wondering if it would work on the moon. Would it? Rick’s answer: Jamie, if you could somehow take a long hike on the moon’s surface, a compass wouldn’t be much help in navigating from one point to another. While the moon does have a magnetic field (which is the force that makes a compass work), it’s much weaker than the magnetic field here on Earth. 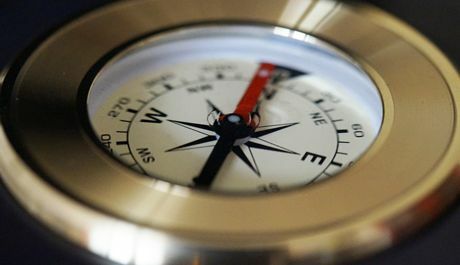 And even if you could find a compass sensitive enough to work with the moon’s weak magnetic field it still wouldn’t be much use as a navigational aid. The problem is the moon doesn’t have a massive molten metal core like the earth does, therefore it doesn’t have magnetic north and south poles. That means your compass would point in all kinds of strange directions as you move about the moon’s surface because it would always point in the general direction of the magnetic object with the strongest magnetic field in your immediate vicinity. Bottom line: A compass would “work” on the moon by pointing towards the strongest magnetic field it managed to detect at the time, but it would be completely useless as a navigational tool. Since you’re obviously intrigued by the wonders of the moon, I recommend that you check out the very short video below! Note: As always, you can watch the video at full screen by clicking the “square” icon that will pop up in the lower-right corner of the video after it begins playing.